Summer is the perfect time to gather friends and family together for a backyard barbeque and a game of horseshoes. Now if there was only something you could do about the hole in the garden where the dog buried his bone, the kids trampled the petunias, or that great spring plant suddenly gave up its will to live… Or maybe you’d like to freshen up the containers by your front entryway. If you are like many people, you might assume that since the heat of summer has settled in, you will just have to live with what you have. What you might not realize is that with careful plant selection, it is possible to rejuvenate your garden with a burst of eye-catching, summer color to fill in those empty spaces and flower pots. One important factor to consider when editing your garden in the summer is choosing plants that have natural heat tolerance. Plants that like the heat have a better chance of getting established in the summertime. You will need to take some extra care for the first couple of weeks to keep your new plants well-watered as they get established in their new home. You might also consider buying larger-sized plants in summer. Larger plants have bigger root systems, which help them absorb enough water to be able to handle the high temperatures. Larger plants will also look more in scale with surrounding plants if you are filling in a hole in the landscape midseason. So, which plants should you have on your summer shopping list? Here are a few ideas. 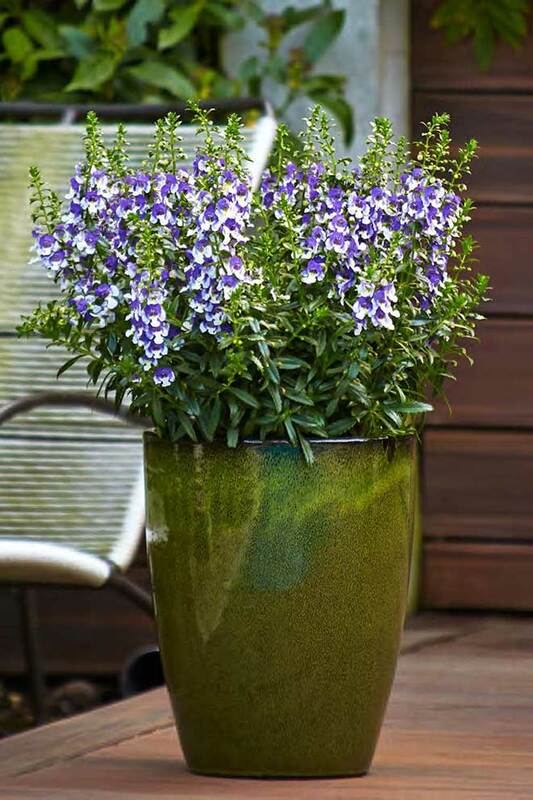 ANGELFACE® Angelonia, commonly known as summer snapdragon, is an upright flowering annual that thrives during the warmest part of the season. Lean in close on a warm, sunny day and catch a whiff of concord grapes from the scented foliage. This South American native can handle dry conditions once it is established. 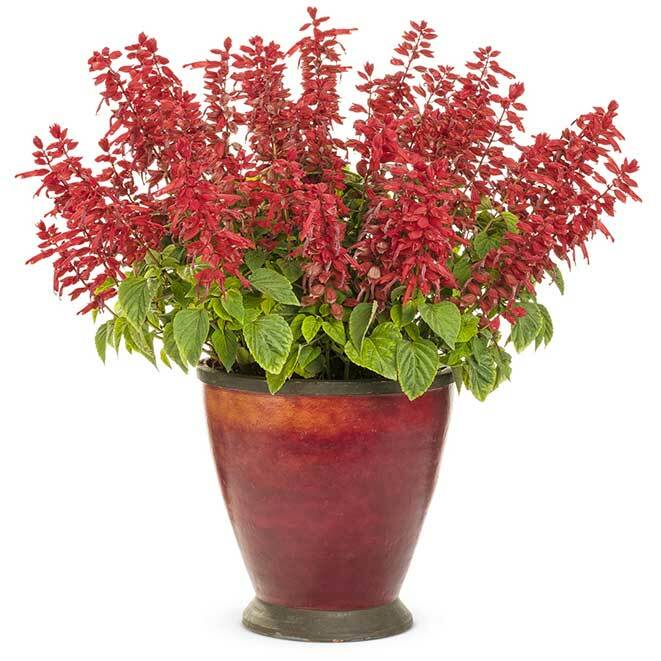 Standing 2 to 3 feet tall, it’s a great plant for adding height to containers and landscapes. Cuphea and Salvia are two classes of plants that are stalwarts in summer gardens and are prized for their fantastic heat and humidity tolerance. 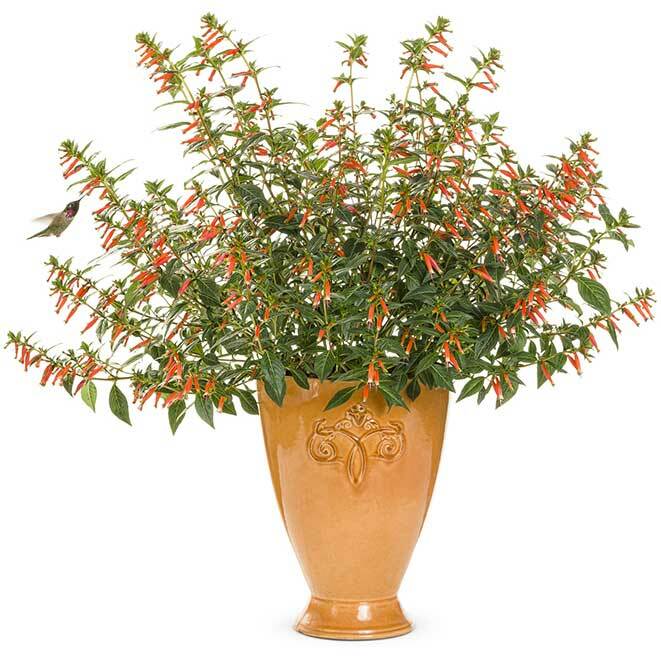 Vermillionaire® Cuphea (above) is one of the best annuals for attracting hummingbirds with its tubular, deep orange flowers that appear all season long. It is drought tolerant and grows well in both containers and landscapes. Ablazin’® Salvia (at the top of the page) comes in both red and deep purple, blooming in sun to part shade all season long. 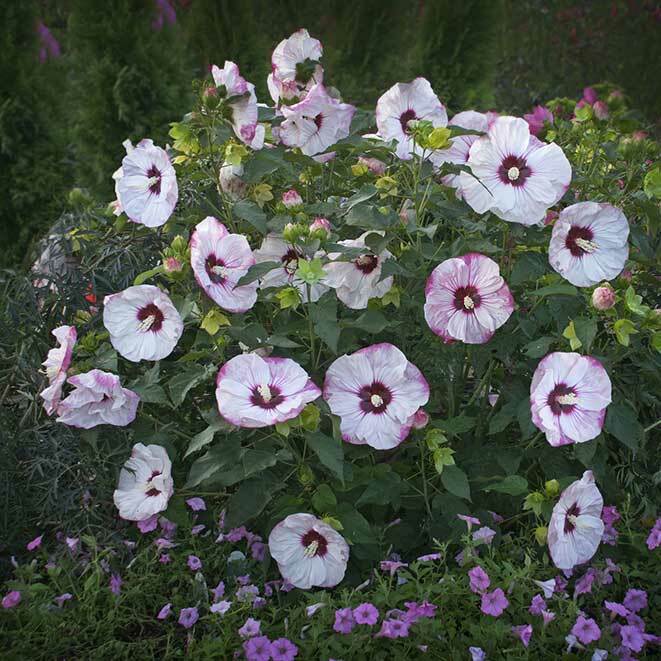 They grow into sizeable landscape-sized plants that add structure and height to garden beds and large containers. You’ll start to see summer and fall flowering cultivars of native perennials like SUMMERIFIC® Hibiscus and PRAIRIE WINDS® Panicum pop up at your local garden centers by midsummer. Later blooming perennials like these need the long, warm days of summer to produce flower buds and put on their best show late in the season. Fast growing, heat loving perennials like ‘Denim ‘n Lace’ Russian sage and ROCK ‘N GROW® sedums are also good to plant in midsummer for a spectacular fall show every year. Hydrangeas are classic summer flowering shrubs that are available in a wide range of shapes and sizes and are commonly found at garden centers in summer. 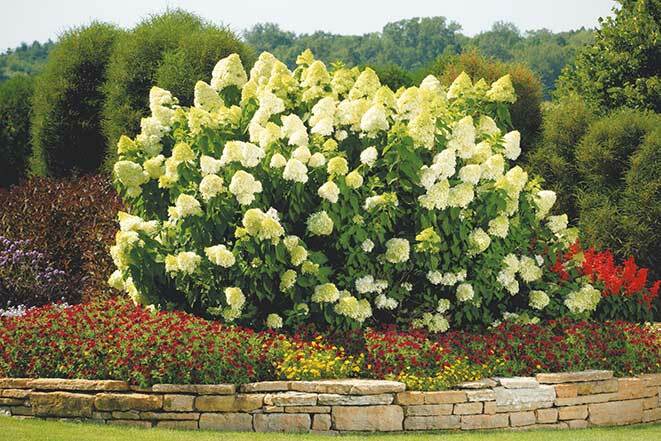 Panicle hydrangeas begin to bloom in mid to late summer and last through the fall months. If you leave the dried flowers intact, they’ll give you something pretty to look at out the window all winter long. If you plant them in summer, make sure to water them deeply and regularly so they can establish a good root system before winter arrives. Spring doesn’t have to be the beginning and end of the planting season. By choosing the appropriate plants for each season, you can add beautiful color to your garden in spring, summer and fall. Contributor Bio: Kerry Meyer lives and gardens in central Missouri on 10 acres near the small family farm where she grew up. She enjoys adding to and improving existing flower beds with the help of her young daughter and husband. Kerry holds a BS in Horticulture from the University of Missouri and an MS in Horticultural Science with a minor in Plant Breeding from the University of Minnesota. Patent Info: Angelface® Angelonia USPPAF CanPBRAF. Vermillionaire® Cuphea USPPAF CanPBRAF. Ablazin’® Salvia USPPAF CanPBRAF. Summerific® Hibiscus USPPAF CanPBRAF. Prairie Winds® Panicum virgatum USPPAF CanPBRAF. 'Denim 'n Lace' Perovskia atriplicifolia USPPAF CanPBRAF. Rock ‘n Grow Sedum USPPAF CanPBRAF.